Stay tuned for upcoming events for Abu Dhabi Race Weekend in near future. Rich List for the fifth year running, host this year’s Race Weekend and will see an extended selection of events and a plethora of A-list talent take to the stage. 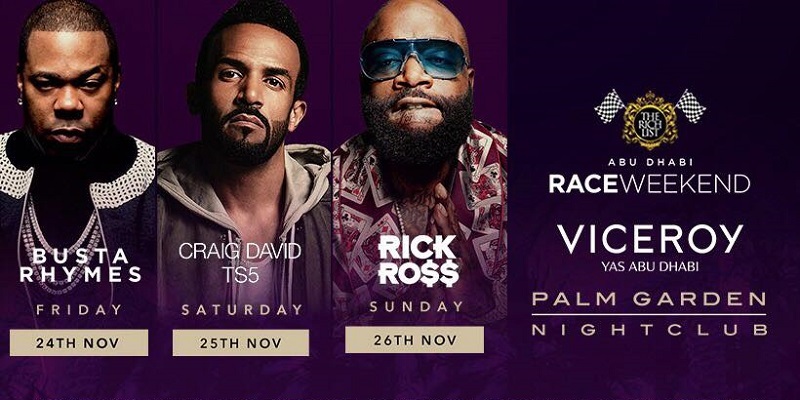 Over the three days of the Race Weekend, starting 24th November, The Rich List Palm Garden Nightclub will party through the night with live performances from Busta Rhymes, Craig David presents TS5 and Rick Ross to be hosted by global celebrity and YouTube star Yiannimize with even yet more additional artists to be announced. Best Viewed at 1024 x 768 pixels and above. This Page loaded in 0.08619 seconds on Fri, Apr 19, 2019 (07:11).